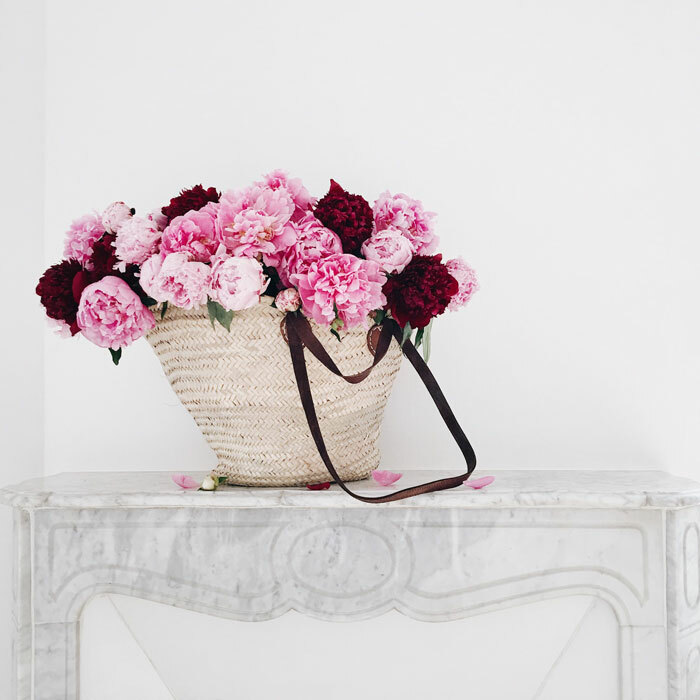 Give your home the vintage French touch it deserves with brocante style. 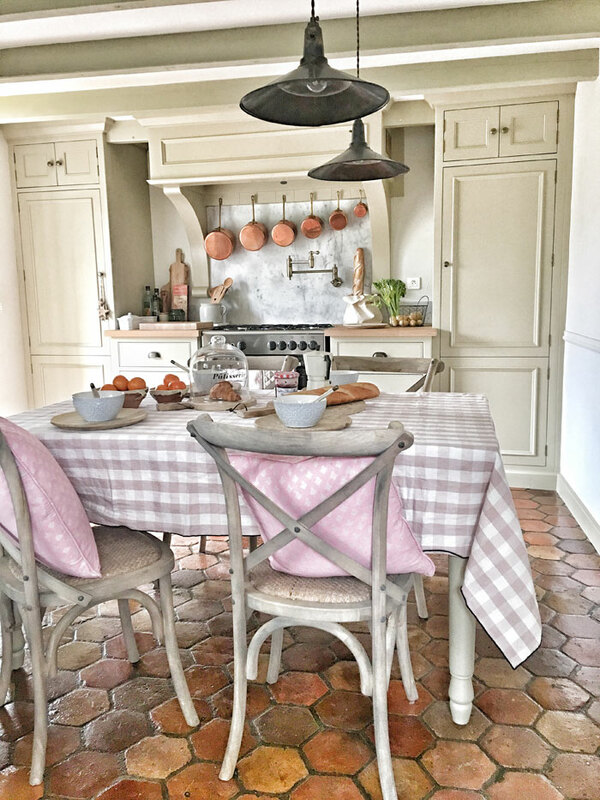 Charlotte designed her kitchen in France with French linens and light wood-finished chairs, bringing color from outside to inside the space. Cabinets, custom-made by Neptune kitchens, serve as the backdrop for the space. 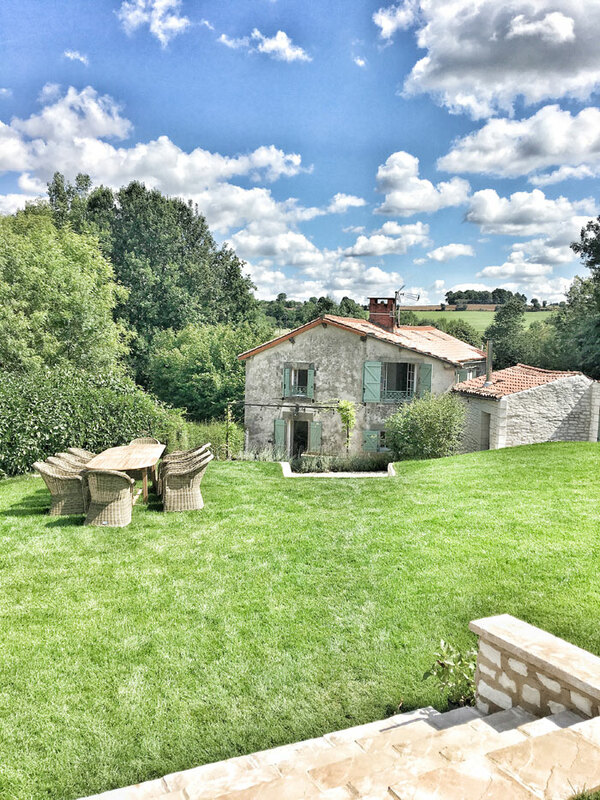 The French countryside has significant influence on its visitors and one visitor in particular, Charlotte Reiss, used that influence to create an online shop. Originally from Morborne, England and a frequenter to France in her youth, Charlotte Reiss moved to the U.S. in her early 20s. Watching House Hunters International one day, Charlotte fell head over heels for France and wished for a country house there. Within a month, that wish came true with a 200-year-old farmhouse in western France near the Bordeaux, Deux-Sèvres region. Its a beautiful day in the French countryside at Charlotte’s 200-year-old farmhouse near the Bordeaux region. The French flea markets played a key role in the start of Vivi Et Margot. Traveling back and forth from Los Angeles and France over five years of construction and renovation on the house, Charlotte was drawn to the flea markets, or “brocantes,” of the area. She searched and found French items to decorate her country home and overtime, her affinity for these vintage pieces grew and grew. Ultimately, she brought back items such as market baskets, vintage wooden spoons and French linens to decorate her Los Angeles home. 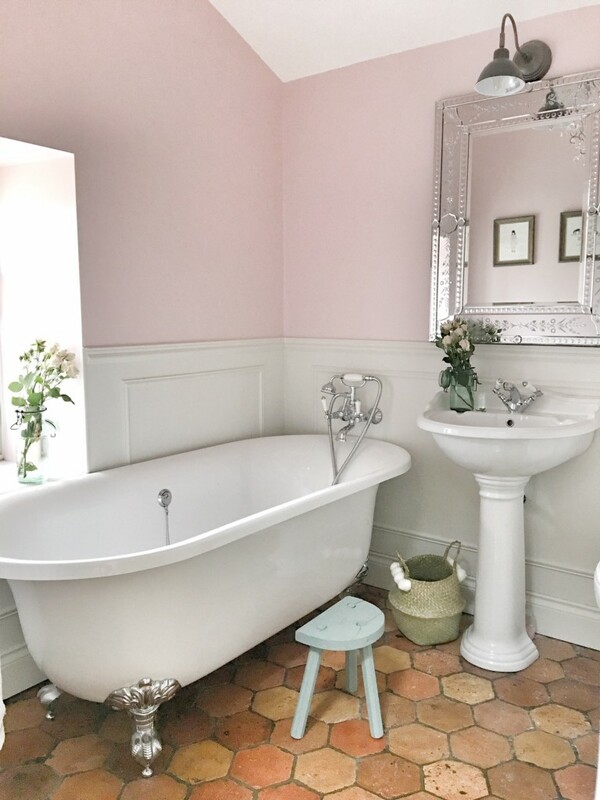 A pretty shade of pale pink is a romantic touch set against the creamy white shades of the wainscoting and the bathroom’s accessories. Originally started as an Instagram page with photos from Charlotte’s home in France, Vivi Et Margot gained popularity quickly and many of her followers wanted to see more French items. Visitors to her home also had such curiosity about where and how to get similar items that Charlotte asked herself, why not open a store focused on making these treasures more accessible to everyone? 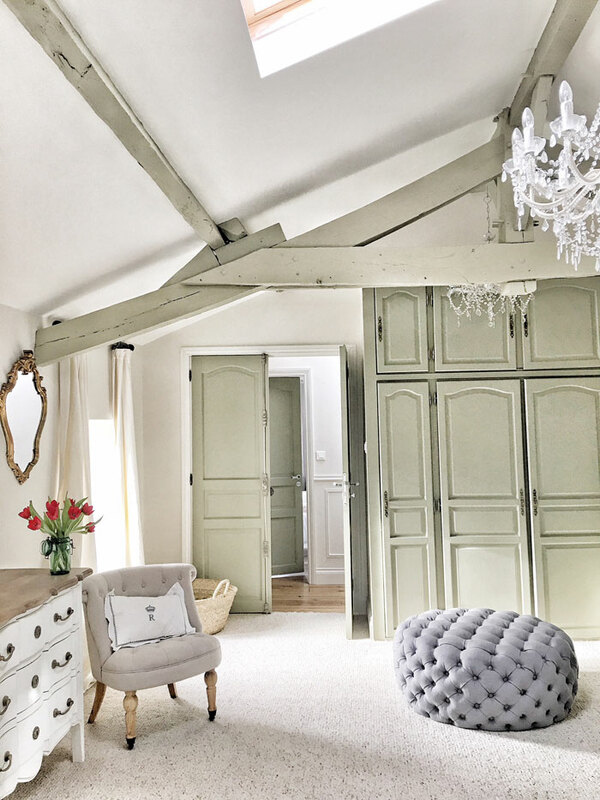 A pale green/gray shade highlights the old home’s woodwork and ceiling beams. Other soft shades of silvery gray and cream create a relaxing atmosphere. During her second pregnancy, Charlotte decided to open her online shop, Vivi Et Margot, to sell “beautiful things” from France. The traditional French homewares store, named after her daughters Vivienne and Margot, combines vintage items and pure French authenticity. “I don’t consider myself to be an interior designer, but I have a passion and love for all things French and maintaining that authenticity with the items I sell,” Charlotte explains. With various products offered from tea towels and market baskets to ceramic pots and wood bowls, the store offers that sophisticated French touch that any home can incorporate. 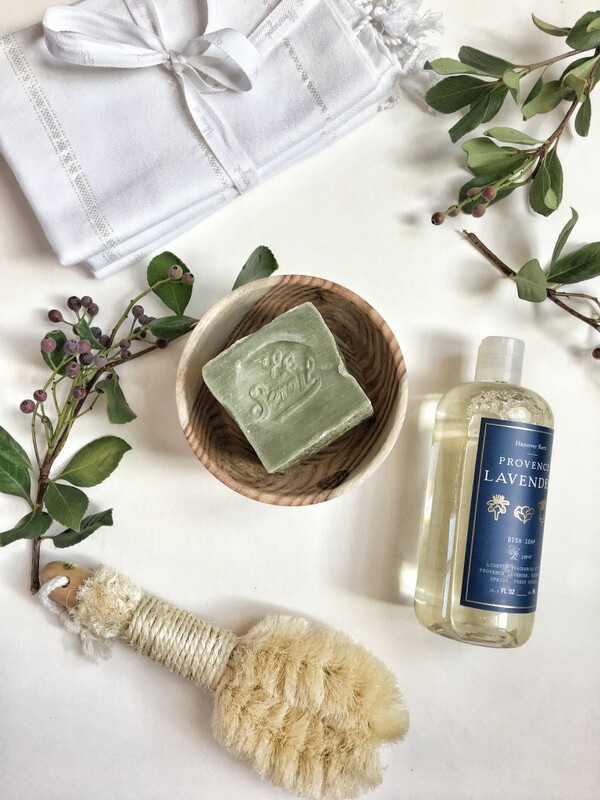 Olive-oil soap, French linens, and other authentically-sourced items from Vivi Et Margot add that perfect French touch to any home setting. “Everything sold is originally purchased in France and imported to the United States,” Reiss says. She curates 100 percent of the items and that way, she is able to “keep the authenticity of the brand.” A veteran of French brocantes, she’s well-acquainted with what’s offered, how to get the best value on items and what to look for. During the summer months while she’s in the country, Charlotte strategically plans entire days around visiting four or five of the best markets in the area. She buys what she would like to see in her own home and what she believes others would also like. Offered in ten different styles, French market baskets are Charlotte’s best-sellers. Typically, she looks for items that match her white-and-gray color palette, aren’t damaged and are also popular among customers, such as café-au-lait pots and linens. However, her favorite and best-selling items are the French market baskets (offered in ten different styles) because of their versatility, durability and functionality. “I use them for everything, and they never fall apart,” Charlotte says. And with free shipping within the U.S., the only response is Oui! For more information on Vivi Et Margot and to purchase her items, visit Charlotte’s website: Vivi Et Margot. To explore more stories on French country style, check out The Ultimate French Country Kitchen, Get the French Country Cottage Look, and The French Farmhouse Look.